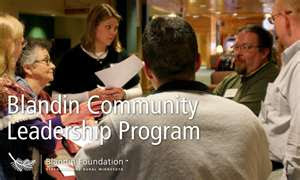 I have been chosen to participate in the Blandin Community Leadership Program. There will be 24 of us from Olivia, Danube, Renville and Sacred Heart travelling to Grand Rapids, Minnesota for a week-long retreat. This will take place February 6 – 10, 2012. Other community members who have participated in this program in previous years have all have found it personally beneficial and also good for identifying community potential and growth. I am looking forward to the experience, not only for my own personal growth but also what I can bring back to our community and how I can share that experience with the City of Olivia.